Corridors of Bus Rapid Transport System (BRTS) in Ahmedabad are aligned with internationally accepted designs, which include space for pedestrians and cyclists. But the design has lost utility among citizens, who use the cycle tracks for everything else (read parking and fast-food stalls) but cycles. The stretches for mixed traffic here are already narrow, and traffic snarls are commonplace. 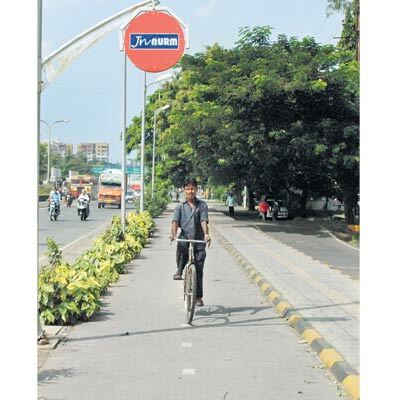 To address this problem, Ahmedabad Janmarg Ltd (AJL) has decided to remove barriers that segregate cycle tracks from the mixed-traffic lanes along all future corridors. Any new corridors, however, will not have separate lanes; only lines/graphic will serve as differentiators. “The new BRTS corridors will have cycle tracks but no raised, concrete demarcation. We will paint lines, instead. It will not be segregated from mixed traffic corridor,” said sources close to the development. Sources also stressed upon need for better enforcement of traffic rules and use of cycle tracks along BRTS corridors. There is also need to create more awareness about cycling and using cycle tracks. “Once AJL has a proper enforcement mechanism, cycle tracks will be segregated again from mixed traffic lanes,” said sources. The executive director of AJL, Utpal Padia, couldn’t be contacted for comment. Meanwhile, Congress and Bharatiya Janata Party (BJP) corporators are on the same page, as far as issue of utility of cycle tracks are concerned. “Cyclists use mixed traffic lanes, instead of using the dedicated cycle tracks. At many places, they (cycle tracks) have been encroached. It is nothing but a waste of space,” said a corporator with saffron party, on condition of anonymity. Only 20km of BRTS corridors currently have cycle tracks. As per sources in AJL, Rs2 crore per km has been spent for constructing the bus corridors.